Before you go to Disneyland there are a few things I find to be necessary. First you MUST have either a cute hair style, cute bows in your hair, or you have to wear Mickey ears. For our first day Hailey wanted to wear her Minnie Ears. I decided a cute addition to those Minnie Ears would be a bow made with Hailey's own hair! I watched a video on YouTube on how to do it and it was TO easy not to do. I loved it, Hailey loved it, and it sure brought some attention to us! 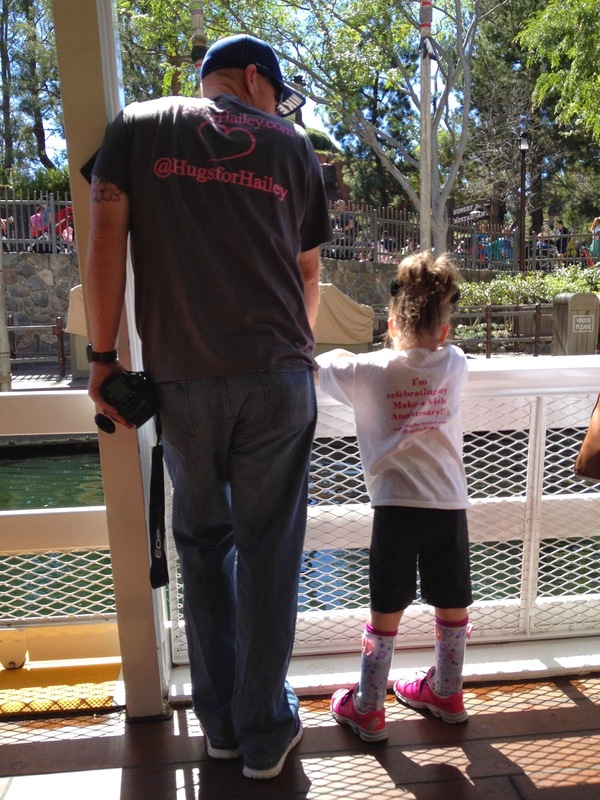 Next, being at such a public place as Disneyland you MUST wear a Disney theme shirt or a Hugs for Hailey shirt. We want to share our story, we want to start conversation, we want people to see how far Hailey has come and the obstacles she faces on a daily basis. Trying to find suitable rides for Hailey can be tricky. Since we've been before we knew the majority of the rides Hailey could go on and we know that most of those rides are at Disney California Adventure. Since there is literally only a handful of rides Hailey can enjoy we also plan our day around the shows they offer. One of the rides that Hailey really enjoyed was Luigi's Flying Tires. It's a mellow ride which you control the movement of. It's like your a puck on a giant air hockey table. This was her first time on the ride and she was worried at first, but after she figured out you don't really have to go anywhere and if you do you aren't going fast she started enjoying it. The first time she went with Josh, the other 3 or 4 times we went all together. Another highlight for Hailey is seeing all the characters. You can even ask the photographer to have the CARS turn down their sounds for sensitive kids. Mater, McQueen and Red like to rev their engines and honk their horns in excitement to see you and you can have them turn that off, which we did. They will even wait until you are far enough away to turn back on for the next guest. Hailey is SO funny how she talks to the characters. She could carry on a 10 minute conversation with each one. She tells everyone how old she is, how to spell her name and that I'm her mom and the guy with us is her Josh. I was so happy when I took this picture below and looked at it in the camera. She looks like a healthy "regular" little girl. She wasn't ataxic, she was standing on her own, you can't see her feeding tube, she's out of her wheelchair. Yes I got teary eyed and I still do when I look at it. I imagine for a short moment how different our lives could be. This picture gives me a glimpse into that world and I get sad wanting to be living in that world with a healthy daughter. It's only for a moment. I know that's not our life, but I'm happy I saw it, if just a for a few short seconds. It's almost a mirage. Another Hailey friendly ride is Heimlich's chew chew train. It's a very easy going interactive train ride. As you ride on a friendly caterpillar he takes you through the oversized giant favorite foods of his. As you go through a watermelon you smell watermelon. As you go through the box of animal crackers you smell vanilla. It's less then a minute for the complete ride but it's a favorite of ours. Finding the characters can be a HUGE task! Once you find them you see the long lines and you wonder if you should just skip it? We usually take turns standing in the line while the other one takes Hailey into a store. Hailey has an obsession with getting autographs. It's one of her most favorite things to do. Besides, we've gotten very good at making friends in those awful lines! Hailey did NOT want to take pictures in her wheelchair. It was with us the whole time and she sat in it as we strolled, but she wanted OUT when it was time for a picture. Since we spent our morning at California Adventure and couldn't find very many characters we headed over to Disneyland to see who we could find. Jasmine, Aladin, and Genie are kind of hidden. You can find them over next to the Jungle cruise in their own little area. I love how Hailey feels that these characters are there JUST FOR HER. She takes their hand and knows the drill. Autograph, Smile, Photo, Go. As I said before Disneyland doesn't have Hailey friendly rides as you might assume. Peter Pan, Pinocchio, Mr. Toads Wild ride, King Arthurs Carousel, Tea cups, Alice in Wonderland, Dumbo. All those rides are a NO go for Hailey. They are either rough/jerky, spin and cause dizziness, or have black light or strobe lights. She can't do any of those. I almost didn't know if she could even do Mark Twains Boat ride. I didn't know if she'd get motion sick (like me) but we tried it and she LOVED it. Her great grandpa was a avid boater so she must have his genes to be a boat lover. Speaking of boats...Hailey LOVES the Jungle Cruise! She thought this boat ride was great. The animals were funny to her she laughed and laughed. We did this multiple times as well. Another boat ride Hailey was weary about was the Storybook ride. When she saw that all these people pile into a boat and go into a Whale's mouth she panicked! She literally saw the people go in to Monstro's mouth and she covers her mouth with her hand and screams, "NO!!!!" So we had to make sure that she saw that the same people made it safely back to shore and that the whale didn't in fact eat all those people. We took her on it and she was fine until she got closer to the Whales mouth, then she freaked, then calmed right down once we were out and the story houses were around us. It's a Small World hasn't been open the 3 times we've taken Hailey to Disneyland. Isn't that super odd? Hailey was pretty wiped out and the sun hadn't even began to set. We decided to pack it on up and we'd watch the fireworks from the balcony by the pool. When we got to the room Hailey's eye's lit up as she saw her bed. 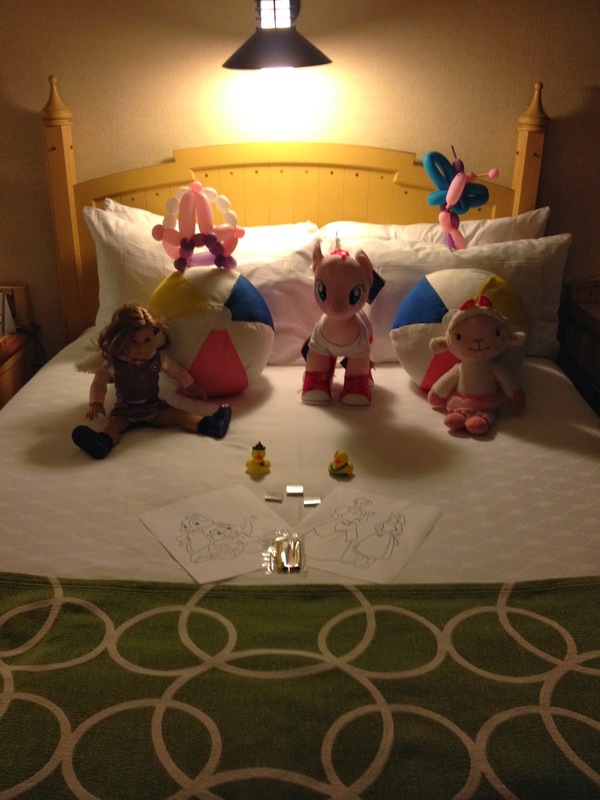 The housekeeping staff went above and beyond putting Hailey's toys on the bed and adding balloon animals, chocolates, rubber duckies, and crayons and coloring pages. That was very fun to see and Hailey LOVED it! Tomorrow would be day 2 and we have a big surprise in store for our girl and I can't wait to tell you about some GREAT people we met!!! !